planetf1.com • View topic - RoKiT Williams Racing FW42 (Livery Only) Revealed! 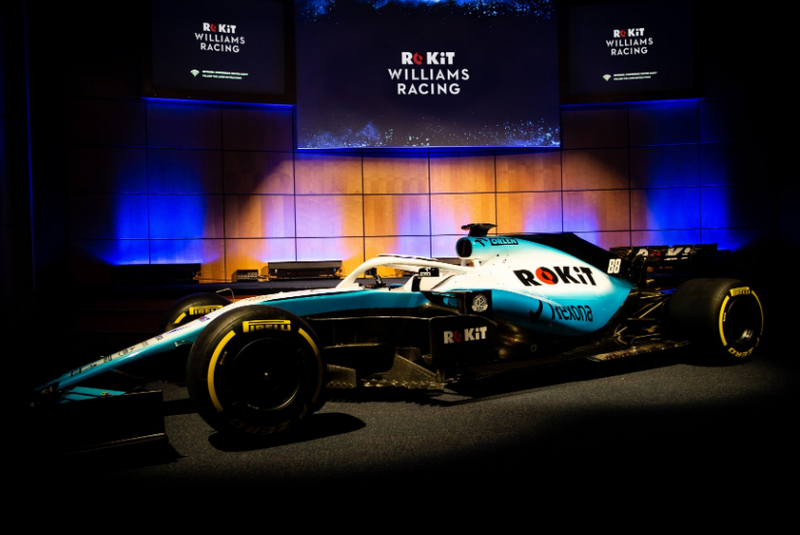 RoKiT Williams Racing FW42 (Livery Only) Revealed! Post subject: RoKiT Williams Racing FW42 (Livery Only) Revealed! Last edited by UnlikeUday on Mon Feb 11, 2019 3:20 pm, edited 6 times in total. Post subject: Re: Williams FW42 (Livery Only)to be Revealed! I really hope it's green. Unlikely but it's a badly underused colour lately. This is the car I'm most excited to see because we have no idea what it'll look like. Im expecting it to feature more dark blue, maybe even getting towards the testing livery from a few years back. One of the teaser images suggested a grey with electric blue, which if executed well could look really, really smart. Have they confirmed the time of the unveil? I can stop refreshing my screen every 10mins now! I’m a Williams fan and also loved the Martini livery. Fingers crossed the new one looks just as good. 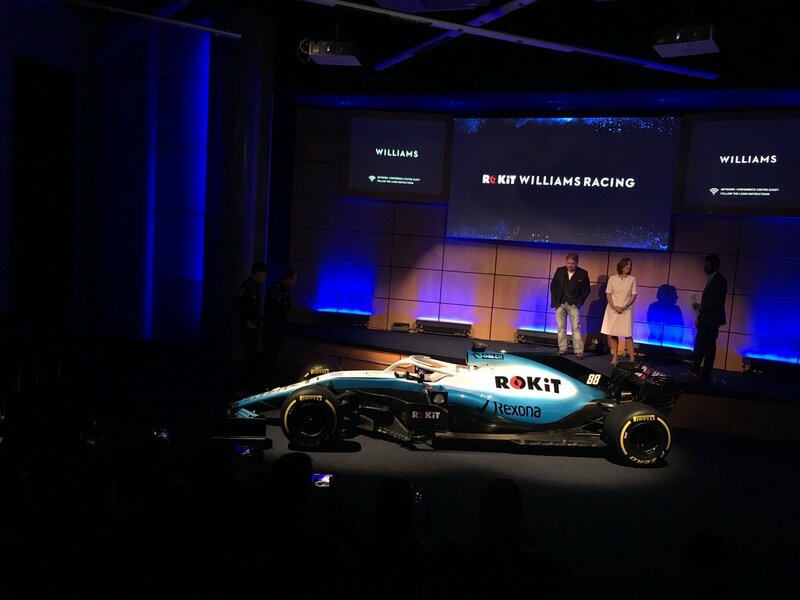 Post subject: Re: RoKiT Williams Racing FW42 (Livery Only) Revealed! It's gorgeous going by the initial look. Yuk, sorry Williams but that looks bad imho. I think they are going to finish last in 2019. 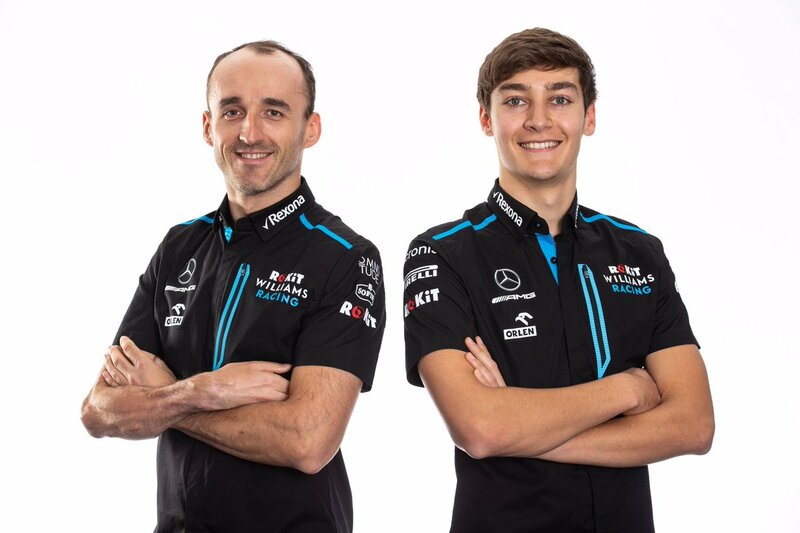 Looks like they tasked the work experience with 5 mins photoshop experience with replicating the Mercedes livery. I like the light blue. Underwhelming. Looks like something you'd see on an F3 car. EDIT: If they got rid of that silly black (they had it on the Martini livery as well) and replaced it with the same light blue/white scheme, it would look massively improved. I must be the only one who quite likes it! I wish they'd gone with that light blue all over though. I'm worried there won't be a lot of colour on the grid this season. It's a resounding ... meh from me. Not horrible, but definitely not one of their best. Think it looks ok. Not as good as the martini livery. Ill reserve final judgment until i see it on track. I'm not a fan. Something about it just screams cheap and tacky. Like the kind of livery you'd get from a team in a feeder series, or the kind of thing you'd see as a generic livery available when creating a team in an F1 game. Not what I'd expect to see on an actual F1 car. is dale jr #88, driving for williams this year ?? I'll echo the comments of others here in that it looks cheap and not particularly well thought out. Lets hope it was because they were directing as many resources as they could to getting the car right in the off season. If they can't it'll remind me of an old saying I'm fond of, "If you can't do the job, at least look like you can do it". If you're going to have a dud car, you might as well make it look good & in the looks department, the Williams has come up short on this one. It's an interesting psychological thing that people instinctively associate a bad livery with an uncompetitive car. For me it is normally the opposite. An uncompetitive car makes the livery bad.. However, i do like the McLaren livery now. I actually meant that I think they will finish last regardless of the livery, which I still think is bad. The comments from Claire about her job hanging on whether or not Frank could part with his 'traditional' navy blue depress me. He should fire her because she ran the team into the ground, not because of a shade of blue that isn't a tradition anyway. The first Willams F1 titles were won with a white car trimmed in green. Then they won a bunch with cars that had prominent yellow, medium blue and red trim, before winning more with medium blue and white. Navy first appeared in 2000, and no titles have occurred since. What kind of tradition is that? Because Williams were so competitive during Frank's last years leading the team? Claire hasn't run the team into the ground. They were backmarkers last year, but that was the first time during her tenure that they were the worst team. Williams ceased being a top team and became just another also-ran while Frank was still in charge. Their drivers this year include the hottest prospect on the grid, partnered with a driver who the majority of fans wanted to see back and who was once a top driver. They have a technical chief who has won multiple WCCs. It isn't reasonable to describe the team as having been run into the ground. I think her comments were tongue in cheek and that you are reading way too much into them. And the truth is that none of us know if the downfall of Williams is her fault. They went pretty much 8 years without a win between 2004 and 2012 which before her time. They benefitted from being the second best Mercedes powered car between 2014 and 2016. Last season was horrendous. The car was woeful and the driver lineup was depressingly weak. Steps have been taken to address tge latter. Time will tell on the former. They have a technical chief who has won multiple WCCs. It isn't reasonable to describe the team as having been run into the ground. They have a technical chief who happened to be at teams who won multiple WCCs but who is not necessarily the common demoninator. If he was so good then Mr Stroll would have tried to take him to Racing Point. This would be plum last. I think the lighting hasn't done them any favours here, there's a yellow tint that gives the car a slightly grubby look. I reckon it'll look better out on track. I'm no designer to say the least but those colours and lines just don't seem to go well together. Too bad. There's only really one color involved - the others are white and black. I'm pretty sure it would be possible to develop a livery - using white, black and light blue - that actually looks good. It wouldn't involve a dubious 2000-era photoshop fade brush as the main design element, however. At the moment i'd say its the worst livery on the grid.